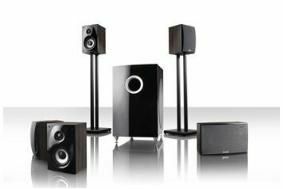 Teufel's new Theatre 80 speaker package available at a 20% discount | What Hi-Fi? Teufel only sells its products online via its own website, and is currently offering UK buyers a 10 per cent discount on all its products, plus an additional introductory 10 per cent discount on the new Theatre 80 system. This means UK customers can buy the Theatre 80 for £345 online for a limited period. The Theatre 80 is designed to be compatible with any AV amp or receiver, and is suitable for rooms up to 30 metres square, the company says. It includes four satellite speakers, a 150W subwoofer and centre speaker, and comes with a 12-year warranty. Teufel also has an eight-week return policy, so you can try the speakers at home in your own system and return them within eight weeks if you're not happy with your purchase.